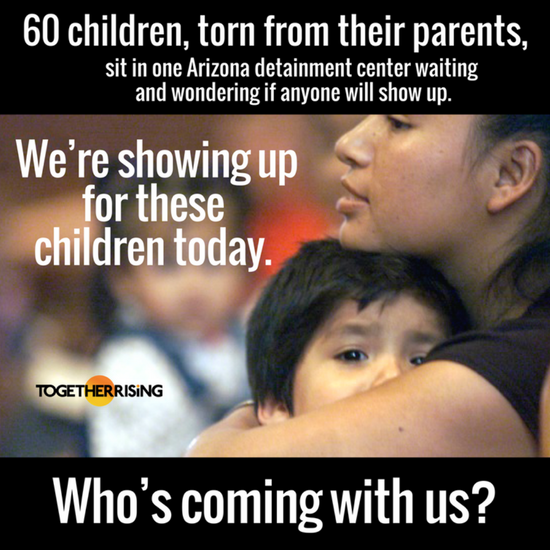 TODAY, TOGETHER WE ARE GOING TO SHOW UP FOR SIXTY LITTLE ONES – AGED TWELVE MONTHS TO TEN YEARS – WHO HAVE BEEN TORN AWAY FROM THEIR FAMILIES, AND ARE SITTING TRAUMATIZED AND ALONE IN A DETENTION CENTER IN ARIZONA. 1) HERE IS WHAT IS NEW, AND UNDENIABLY HORRIFIC: Our government has changed its policy about families who cross the border, and it is resulting in families being torn apart. Historically speaking, with few exceptions, the U.S. has treated immigration violations as civil — rather than criminal — offenses. Therefore, children have not typically been torn away from their parents even when the parents enter the legal system as a result of immigration violations. Families were, at worst, detained together, or they were released with notice to appear at a later court hearing. However, the current administration has dismissed this historic practice as “catch and release” and in its place has established a “zero-tolerance” policy – subjecting “100% of illegal southwest border crossings” to criminal prosecution – even crossers who may be asylum seekers. So now, parents are ensnared in the criminal system, their children are immediately ripped out of their arms without explanation, and parents and babies are sent to different detention centers – often hundreds of miles away from each other. The stated goal of 100% criminal prosecution will mean 100% family separation. Last week, a Border Patrol official testified that 658 children were taken from their parents in just two weeks in early May. At this rate, more than 4,000 children will be separated from their parents this summer. The reports are that parents and children who have been forcibly separated are traumatized: Experts have labeled this sudden family separation to be torture. These traumatized children sit in centers alone without their parents, and without legal advocates, they don’t know what is happening or where their parents are. There are no public defenders for these children, so if their cases are not taken on by non-profit American groups, children as young as two are required to stand in front of judges alone and “defend themselves.” Asylum cases are very complicated and the law is difficult, and the judge often orders them returned to the violent country their family was desperate to flee – which can become a death sentence for these children. It is also up to that country’s government to reunify the deported children with their parents. This often doesn’t happen smoothly, and parents must fight to find their children, navigating complex systems across borders. We will fight for these kids like we’d fight if they were our kids. Because they are. We will fight for these mothers like we’d fight if they were our sisters. Because they are. We are going to help get these babies back into their parents’ arms. We’re going to start with the sixty little ones- aged 12 months to 10 years – sitting in an Arizona detention center right now. These little ones need help, and they need that help to come in the form of bilingual lawyers trained to deal with traumatized children. We — through the Florence Immigrant and Refugee Rights Project – are going to provide and fund two lawyers and two advocates who will be responsible for representing every child in that center and every one of their parents. Their first priority will be to establish and maintain contact between child and parent. Their ultimate goal will be reunification and safety and rehabilitation for each child. Children are alone, right now, traumatized in these detention centers, desperate for their parents. Parents are sitting in detention centers, right now, desperate for their babies. They loved their babies enough to risk their lives to get them to safety. They love their babies. Just like we do. Just like we do. For now: Do not allow your heartbreak to go wasted. TURN YOUR HEARTBREAK FOR THESE CHILDREN INTO HELP FOR THESE CHILDREN. If my country was ravaged with violence and my children were in constant danger, I hope I’d have the courage to do whatever it took to get them to safety. I hope that when we got there, we’d be cared for instead of terrorized. And if I were ever separated from Chase, Tish, and Amma, I’d hope that some mothers, somewhere out there, would care enough to get them back to me. Today we give our kids Love. EVERY TAX-DEDUCTIBLE PENNY WE RECEIVE WILL GO DIRECTLY TO REUNIFYING THESE BABIES OF OURS WITH THEIR PARENTS. If we all show up today and meet the needs of our children in Arizona, we will then turn our attention to funding the incredible, and already thoroughly vetted organization Young Center for Immigrant Children’s Rights, which operates around the country, including on the border, providing advocates for unaccompanied, detained children. We spoke with them all weekend, and they are in desperate need of an additional attorney to step up to address the influx of children into the detention centers. We promise you this: As long as you keep showing up, we will continue to meticulously match your dollars with the exact organizations doing the most vital work — until as many of these precious children as possible are reunited with their parents.